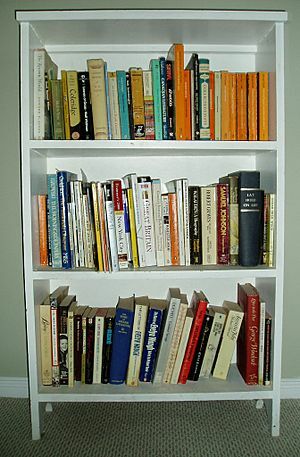 A bookcase, or bookshelf, is a piece of furniture that is used to hold books. Bookcases can be different sizes, from a small single shelf to a large bookcase that can fill an entire wall. Libraries have many bookcases holding books on many different topics. In imperial China, there were revolving bookcases. They are described in 8th- and 9th-century Chinese writings. They were popular in Buddhist monasteries during the Song Dynasty. A revolving bookcase is shown in Li Jie's Yingzao Fashi. Books used to be written by hand. Not many of them were made. At that time, they were kept in small boxes or chests. The boxes or chests were carried around with the owners. When people started having a lot of books and other manuscripts, they kept them on shelves or in cupboards. Later the cupboard doors were removed. The cupboards then looked like today's bookcases. The oldest bookcases in England are in the Bodleian Library at Oxford University. Those were put there near the end of the 16th century. Bookcase Facts for Kids. Kiddle Encyclopedia.